First Indemnity Insurance Group prides itself on its high standards of client service. We are continually looking for ways to enhance the customer experience. We are now offering two new services online to assist our clients with certificate of insurance requests and instant contact information for the assigned First Indemnity underwriter contacts. 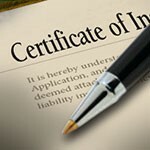 To submit a formal request for a copy of your Certificate of Insurance, click here. To determine your assigned First Indemnity underwriter contact, click here.